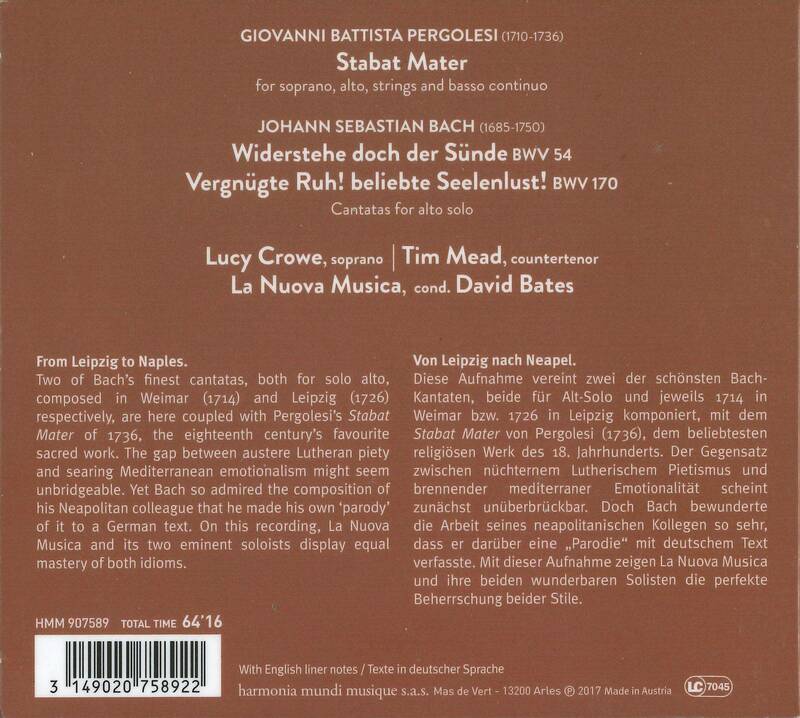 Two of Bach’s finest cantatas, both for solo alto, composed in Weimar (1714) and Leipzig (1726) respectively, are here coupled with the delicious agony of grief that is Pergolesi’s 'Stabat mater', an acknowledged masterpiece by one of the 18th century’s most influential composers. Bach so admired the composition of his Neapolitan colleague that he made his own ‘parody’ of it to a German text. On this recording, La Nuova Musica, in its 10th anniversary year, and its two eminent soloists display equal mastery of both idioms. Counter-tenor Tim Mead is praised for his “alluring…consistently excellent” interpretations (The New York Times). With his “rich, mellifluous sound” (Guardian), he is recognised as one of the finest across the generations of counter-tenors. Described as having a voice of bell-like clarity with an impeccable vocal technique and powerful stage presence, Lucy Crowe has established herself as one of the leading lyric sopranos of her generation. 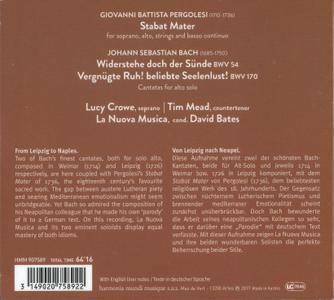 The last few years have been a period of extremes for Pergolesi’s Stabat mater. High-profile recordings have veered wildly between anachronistic richness and thickly painted vocal lines (Yoncheva and Deshayes on Sony, Netrebko and Pizzolato on DG) and near-anaemic period precision (Lezhneva and Jaroussky on Erato). Anyone longing for a bit more moderation – a performance embracing both the rose and the yew tree in this exquisite Latin hymn – should find plenty to console in this thrilling new recording from La Nuova Musica. In Lucy Crowe and Tim Mead the ensemble have both period specialists and singers with enough muscle and tone to temper stylistic precision with human drama. Together they lead a performance that is both meditation (a ‘Quando corpus morietur’ of infinite restraint, whose legatos seem endless; the opening ‘Stabat mater dolorosa’) and a vivid sacred drama (Crowe’s nervy, fretful ‘Cujus animam gementem’; the urgency of duet ‘Fac, ut ardeat cor meum’). David Bates and his ensemble take an active part in the drama too in a performance that might have its moments of beauty and innocence, but that keeps the image of the bloodied cross, the long walk to Golgotha, ever before your eyes from the dull thud of the opening bass line onwards. Speeds tend to the swift, banishing any thoughts of sentimentality from a performance as sophisticated emotionally as it is musically. In an intriguing booklet-note, Mark Seow notes that Bach was so taken with the Pergolesi that he arranged it himself. Sadly this curiosity doesn’t feature here; instead we get Bach on more familiar ground – solo cantatas ‘Widerstehe doch der Sünde’ and ‘Vergnügte Ruh! beliebte Seelenlust!’ performed by Mead. Both showcase a countertenor voice going from strength to strength, powerful but never pushed, pure but not affectedly so. If the phrases span with just a little more freedom, taking away as well as giving, then there would be nothing left to ask. I was excited about this recording because it features two of my favourite baroque voices of the moment – countertenor Tim Mead and soprano Lucy Crowe, but it turns out the instrumental playing is just as enticing. 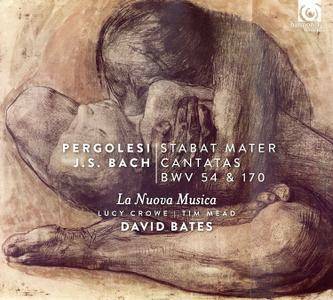 La Nuova Musica, under David Bates, sound lush and languid in two of Bach’s alto cantatas (BWV 54 & 170). They let phrases sigh and breathe and supply a decent amount of bass under properly expressive melodic lines. In Pergolesi’s Stabat Mater, the ensemble sounds sparser but not astringent, and I love the space and tenderness Bates allows in the aria Fac, ut portem Christi mortem. And the singing? Crowe and Mead are both in sumptuous voice, and both fiery in the most dramatic moments of the Stabat Mater, but her nimble grace and charisma is occasionally weighed down by his more flannelly delivery. He sounds beautiful in the cantatas, though, searching out all the most resonant corners. DR13 -3.17 dB -22.62 dB 6:24 17-Bach: Vergnügte Ruh! beliebte Seelenlust! BWV 170 - I. Aria: Vergnügte Ruh! beliebte Seelenlust!